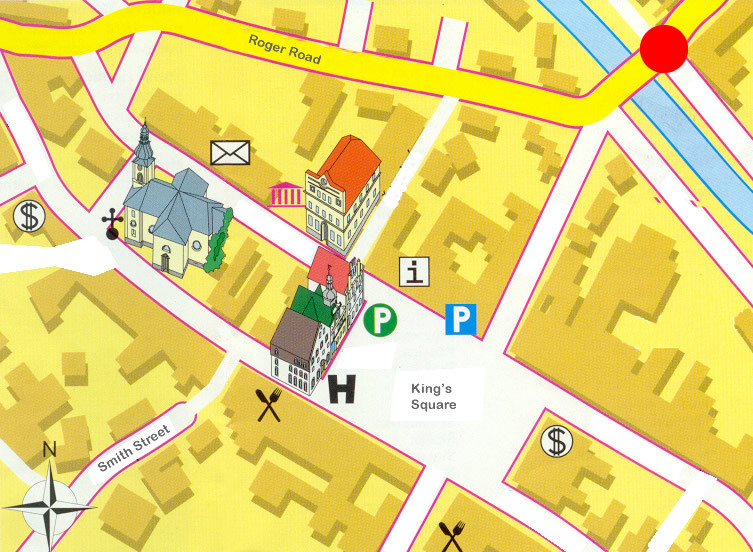 Giving Directions is an activity to practice giving and receiving directions around town. It’s simple to set up and involves practice in speaking and listening. You will need a town plan (or section of a town) for the class. With beginner classes the plan can be very simple but with more advanced classes it can be bigger and more complex. The plan should have major landmarks on it but not all streetnames. Tourist maps are quite good for this. Mark on the plan the starting point. In the plan above, it’s the red dot in the top right. Next you will need to photocopy one copy of the map for each student in the class. Now give out a copy of the map to each person in the class. Take one for yourself and mark on it a cross in any position. Explain to your class that you are going to tell them where you live and they need to follow your directions. From the red dot, walk into town over the river. At the first junction, take the second left. Walk all the way down into the square. When you reach the square, cross over it and take the road opposite. I live there on the right, opposite the restaurant. Have the students mark your house on their map and then check to make sure they’re all in the right place! Once the students understand how the activity works, they can play the game amongst themselves. You might have them in pairs, back to back, telling each other directions from the red dot to their house, or you might have them in small groups with one person standing and telling the rest where they live.